Had I been paying attention back in April, I would have definitely pre-ordered this set! The pre-order price was 60 British Pounds which comes to about $95 USD + the cost of shipping so I estimate it would have been around $130 USD. Unfortunately, I didn’t know about this box set until it had already sold out (in 3 days!) and it’s going on Ebay anywhere from $300 to almost $900 at auction and Buy It Now. 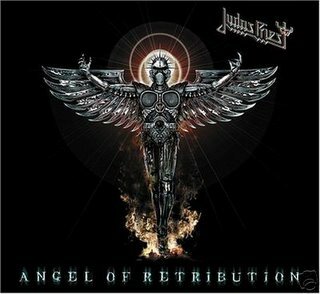 There were only 500 copies made so it’s a rarity for sure…..read the press release below to see what was inside. plus the full and complete Saxon W:O:A performances from 2004/2007/2009 – each on a separate DVD and, a Saxon flag. 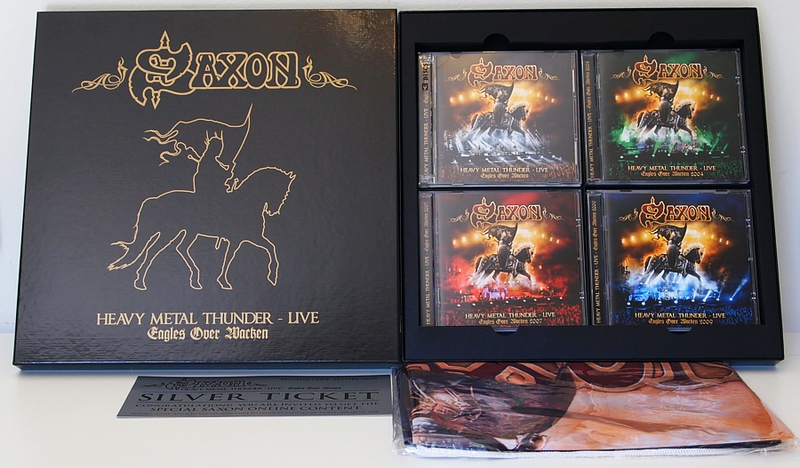 The real surprise is that 10 ‘Golden Tickets’ are randomly included in the box sets, which will allow the 10 lucky winners to visit any Saxon concert in any city around the world (excluding festival appearances). ‘Silver Tickets’ giving access to special online content are for the remaining boxes so there are no losers – only winners. I already paid $18 for the limited edition 2 CD/DVD version so I would have easily shelled out the extra $112. 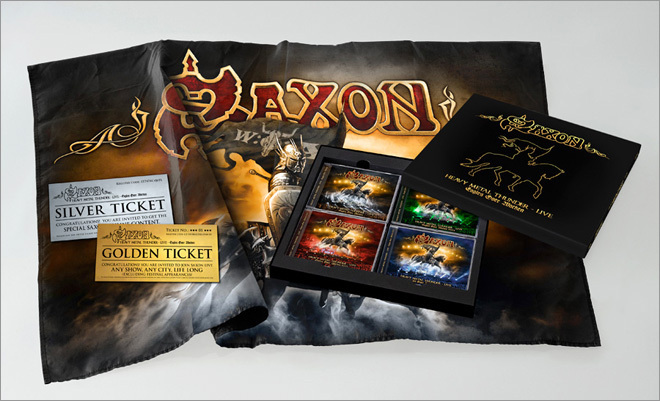 Full DVDs of each Wacken show and a commemorative Saxon flag are highly collectible as is the special box and the Golden and Silver tickets that allowed buyers to either see Saxon in concert ANYWHERE IN THE WORLD and/or access bonus contect online. Even with the DVDs being PAL format I would have been fine because my DVD player is region free. Saxon is one of my all-time favorite bands, I can’t believe I missed out on this. I will be watching and, if I find one at a decent price (albeit higher than the pre-order), then I will be on the hunt!